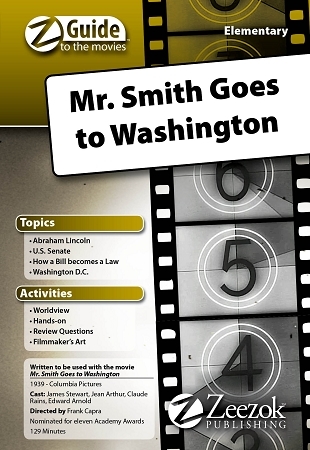 Zeezok Publishing's Elementary Z-Guide to Mr. Smith Goes to Washington is a great way to incorporate media into your social studies curriculum. This is the story of a crusading senators stand for truth. With the help of his secretary freshman Senator Jefferson Smith stages a filibuster in a valiant effort to expose the corrupt Taylor political machines influence on Washington D.C. politics. A David vs. Goliath classic based on the timeless theme of liberty and justice for all Mr. Smith Goes to Washington should be required viewing for every American citizen. This Z-Guide contains a topic overview a movie synopsis and ten learning activities for an in-depth study of the film. Review the process of how a bill becomes law. Learn more about the U.S. Senate and Abraham Lincoln. Review the movie as you tour Washington D.C. and round out the fun with a crossword puzzle. Get the entire family involved with the For Family Discussion section at the end of the guide. Choose those activities which best fit your students course objectives areas of interest or time schedule. Sorry movie and popcorn are not included.